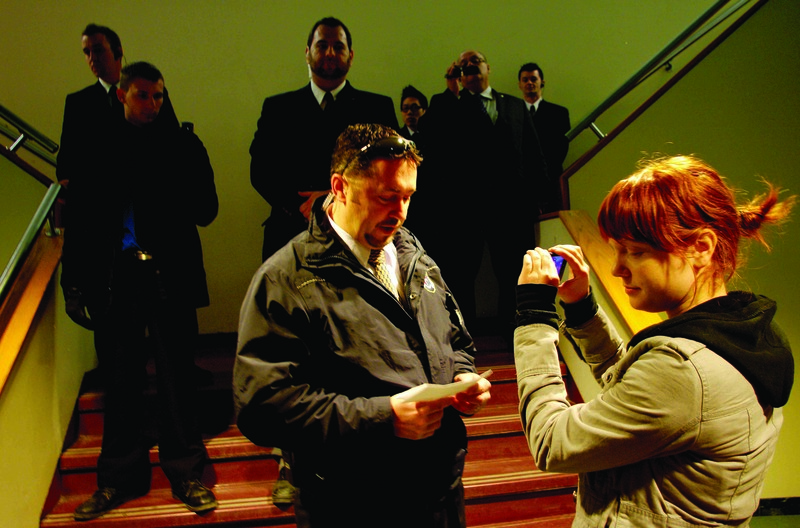 Extra security presence on campus causes tension with students. Photo by Navneet Pall. The first major altercations between university security and students happened on Monday, March 26, following the reaffirmation of Concordia’s strong stance against hard picketing tactics. While some students were participating in a sit-in on the 7th floor, another group of students were facing half a dozen security guards on the 4th floor. The conflict began when a group of geography students used hard-picketing tactics by blocking the entrance to their classroom. Protesters were met by security who showed up to make sure “there would be no incident.” Several students felt intimidated by the guards, who were also filming the picketers. “I think 30 years ago we would have never seen this kind of pressure from the administration to force a union [security] to cross another union’s picket line,” said geography student Jess Glavina. Last week the university sent an email warning about consequences for students who choose to continue blocking access to classes, which could include formal charges. Eventually, the geography professor who was supposed to teach the class cancelled it, telling security there were not enough students in attendance. Earlier that day, a similar altercation resulted in an incident that drew attention on the Internet after it was posted by CUTV. A student who was filming an argument between security and students in the Faubourg was struck in the face by one of the security guards, throwing the camera out of her hands and onto the ground. “Get that guy’s name because he just hit me in the face,” the student was quoted as saying in the video. The security agent eventually left the premises without identifying himself. Following this initial incident, the student persisted that she wanted to file a formal complaint against the guard. In the university’s March 23 email to all students, it stated that it was “no longer possible to tolerate further disruption of university activities by a minority of protesters who refuse to respect the rights of others.” The email went on to say that the university will from now on lay charges against those who choose to block access to classrooms. The university said it also encourages students to report any incidents that prevent them from getting to their classes. Students who are found hard-picketing will be asked by the university security to provide IDs and will be reported to a panel to face the appropriate charges. Those who refuse to identify themselves will have their pictures taken in order to be identified. Walcott believes that the university’s decision to come out with a heavy-handed stance proves that the student movement’s tactics are working.